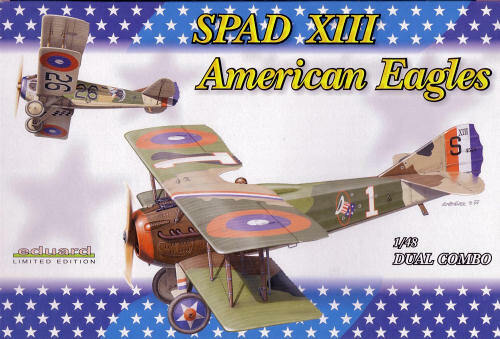 This is a Special Edition Dual Combo version of the SPAD XIII (late version) kit. The plastic in this version of the kit is the same that you get in the original release or the Weekend Edition of the kit. Rather than re-hash what Tom covered in his preview of the kit, I’ll focus on the extras that make this Dual Combo kit special. I’ve only included the parts that are unique to this kit in the photo—if you want to see the sprues, look at TC’s preview. First off, you get two copies of the kit—each sealed in its own plastic bag. In fact, the bag of plastic parts is interchangeable with the ones in the other editions of the kit. (I’ve got the Weekend edition as well, and the bags are exactly the same.) You also get two copies of the PE fret that was included in the original release of the kit. - Four by six portrait prints of Eddie Rickenbacker and Frank Luke. - Resin figures of the two Aces. - A small enameled pin of the 94th Aero Squadron’s “Hat in the ring” logo. - A set of tape masks for the wheels and windscreens. (1) Capt. Edward Rickenbacker’s “1”, probably the most famous American SPAD, from the 94th Aero Squadron, 26 kills. (2) Lt. Frank Luke’s “26”, arguably the second-most famous American SPAD, from the 27th Aero Squadron, 18 kills. (3) Capt. Gorman Larner, 103rd Aero Squadron, 7 kills. (4) Lt Jacques Swaab, 22nd Aero Squadron, 10 kills. The kit includes a 16 page instruction booklet, that barely fits in the bottom of the kit box. The instructions include full color profiles of the four finishing options. A nice touch is that the profiles callout the differences in the camouflage applied to the aircraft built by Bleriot and Kellner. The instructions even include painting instructions for the two figures, even calling out the correct hair color! The Eduard kit is the best kit available of the SPAD in 1/48 scale. For basically double the cost of the original kit, you two complete kits, plus the nice little extras—the figures and the pin. 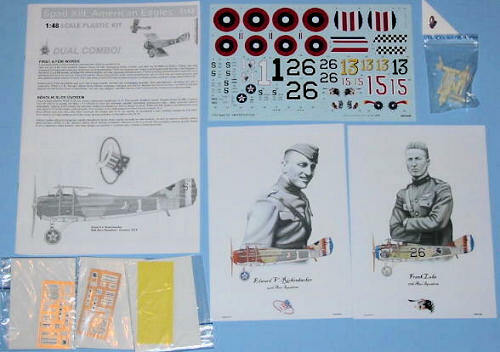 Aftermarket decals for American SPADs are hard to find— and all the other releases of this kit so far have had decals for French aircraft. This is the kit to get if you want to build a couple of American SPADs.